When I typically think of Los Angeles, California, I think of sunshine, beautiful people and healthy food. All of this seems to be true, but let me tell you, the people of Los Angeles also know a thing or two about fast food/comfort food spots! 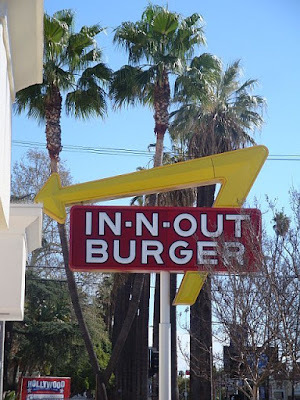 Whether you are cruising down Santa Monica Boulevard, the Sunset Strip, Robertson, Melrose or Hollywood, you will quickly notice that there is no shortage of burger joints. There's Jack-in-the-Box, Apple Pan, Umami, Hole-in-the-Wall, Burger Joint, Pinks...you get the idea! 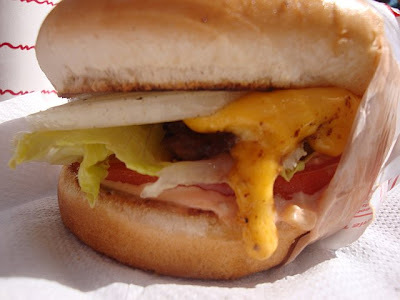 But, one of my all time favorite's is In-N-Out Burger!!! Holy Cow (no pun intended:-) this place rocks! The first one opened up way back in 1948, so it's pretty safe to say that they seem to know what they are doing when it comes to burgers. So naturally, I stopped off for one when I was there. (Now I'm kicking myself for not having more!) 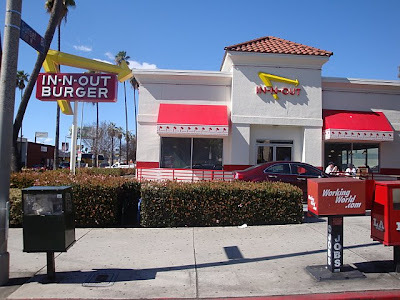 Their cheeseburger is made from a 100% pure beef patty, and is topped with lettuce, tomato, onion (if desired), one slice of American cheese, and their special sauce (tastes similar to the sauce on a Big Mac). Yes, they have fries, but I say you can leave them out as the burger is SOOOOOOOOOOOOO good! But don't go there and not order a milkshake to wash it all down...(chocolate or vanilla)...both delish! 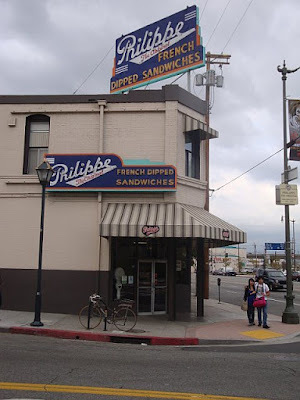 A bit further away from the downtown area (in Chinatown to be exact) is Philippe's (pronounced Phil-ee-peez). 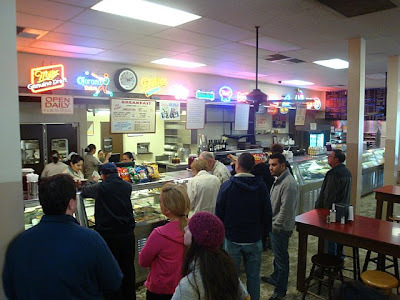 This is one of the oldest restaurants (1908) that specializes in the French Dip sandwich! 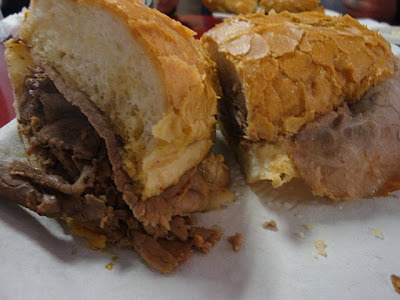 Legend has it that a man by the name of Philippe Mathieu invented the French Dip when he accidentally dropped the sliced french roll for the sandwich into the roasting pan filled with juice drippings. The customer, a police officer, said he would take it anyway, and the very next day returned (with some of his friends) for another one the exact same way! You can order it with beef, pork, ham, lamb or turkey. Beef is the classic, and what I ordered. You can also ask for it single-dipped or double-dipped in the gravy (the way to go if you ask me!) I put just a little bit of their Hot Mustard on it...it's HOT, but homemade and oh so good! 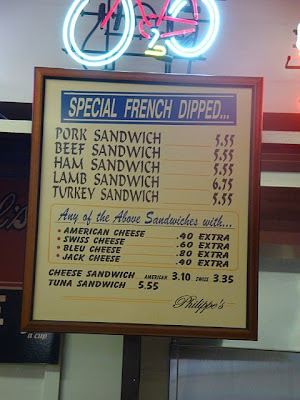 I have to say this was by far the BEST french dipped sandwich I have ever had! All sandwiches cost $5.55, except for the lamb which goes for $6.75. The atmosphere is fun...it's sort of a blast from the past with cafeteria-style service and sawdust on the floor! 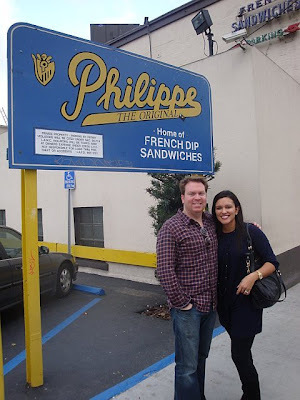 Philippe's is open everyday (except Thanksgiving & Christmas) from 6AM til 10PM...so you have no excuse but to go the next time you are in Los Angeles. Be prepared to wait...the lines can be long...but it's worth the time! Well after all of this meat, you need a little something sweet, right? 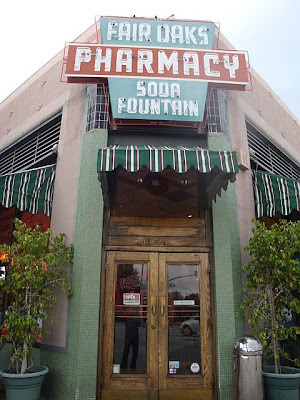 And have I got the place...Fair Oaks Pharmacy and Soda Fountain in South Pasadena, California. It's a South Pasadena landmark, opened since 1915, and located on the historic Route 66. This place is so cute inside...it still looks like it did when it opened; old-fashioned! 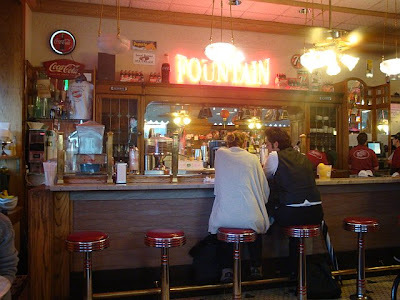 You can shop in their pharmacy and store if you need some toiletries or little trinkets to bring home with you, but the reason so many people go here is for the real goodies that you can eat at the soda fountain. 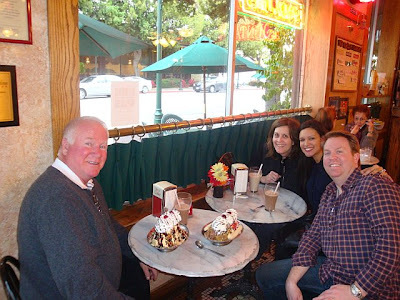 You must order their All-American Banana Split! For $7.25, you get HUGE scoops of vanilla, chocolate and strawberry ice cream, topped with hot fudge, strawberry and pineapple sauces, and all nestled inside of a split banana! It's enormous...that's why I personally think they call it a split because you have to split it with someone, it's too big to eat on your own! It was amazing! :-) I also tried one of their Egg Creams for $3.50, an East Coast favorite, that's made with soda water, milk, and your choice of vanilla or chocolate. (I ordered the chocolate). I have to honestly say I didn't love it (too watered down)...that was the one thing I would say the west coast should leave to the east coast. But after the banana split, you don't really need anything else! The last place I must talk about when it comes to comfort food in L.A. is a place called Urth Cafe. 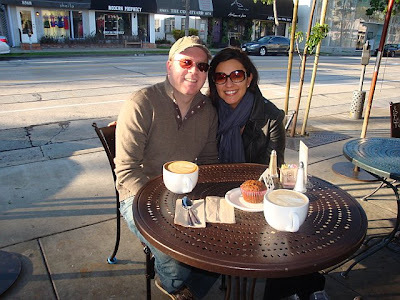 There are a few locations throughout the city, but the one on Melrose Avenue is the original one, is often frequented by celebrities, and has been on an episode or two of Entourage & The Hills. 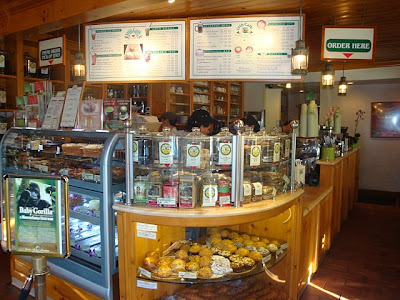 They have everything from coffee, pastries, and a full breakfast menu, to lunch and desserts as well. 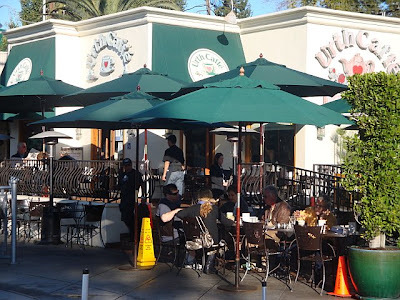 Everything at Urth Cafe is fresh and the coffee is organic. If you go, you must try one of their Spanish Lattes...basically a latte with a kick! This place is great all around! Lori, I can't believe the size of that banana split!!!! I want one right now and don't want to share. The burger doesn't look to bad either, but ice cream is my weakness. You always find great places to eat and all different types of food. 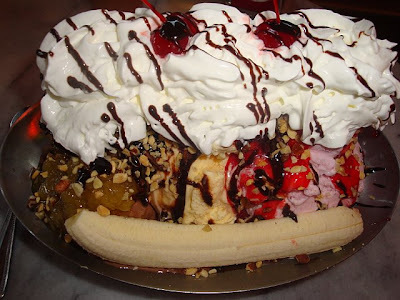 Tell me about it...I know, the banana split is huge! I could so go for another one right now, that along with a burger and a french dipped sandwich and a spanish latte for dessert. Gonna have to hit the gym harder if I keep this up, huh? :-) Thanks for reading Pat!